.....crocs are not suitable footwear for fetching firewood from the wood shed. Big rusty nails go straight through and cause excruciating pain. Owwwey!!!!! If I could walk, I would go down and take a photo of the nasty culprit to show you....it was a bigg-un! Tetanus booster done, now on antibiotics, strong pain killers and instructed to keep my foot elevated.....(we all know how impossible that is in a busy household)! Sorry for the slackness of my blog updates lately. I will do better I promise! Geez, I wear my crocs outside all the time, will have a rethink about that now. I can feel the pain of it all the way up here, hope it is getting easier for you. Probably that darn needle hurt more than the nail. Hello my darling, I am back from the travels.....what a super time we had, and I can hardly wait to see you all and show you the 955 photos that I took! 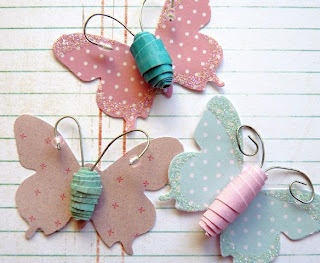 Those little butterflies are superb, good idea to use them for bd cards. I've finally got my desktop computer set up. YAY!! And have just had the chance to pop in here to see what you're doing. OUCHY! You're poor foot. I hope it's on the mend by now???? I miss you too! Can't wait til September. OUCH penny...ya that would HURT!!!! !